Will's Korean Journey: The art of matching in Korea. I remember when matching with your significant other was cool. I think it was junior high school. I remember matching my vest on my tux to the color of the dress that my date was wearing for prom. After that, well matching more or less went out the window. Well, here in Korea, matching with your significant other is a fine art, in fact its a requirement. You have multiple stages of matching, each one more emasculating then the next. It starts off so simple. Matching hats. Now, not everyone in Korea will do this, but it normally starts with a simple baseball cap for both of them. However, from here it goes down hill, and quickly. It may move from baseball caps, to beanies, or in a lot of cases matching animal hoods. These hoods are wickedly popular in Korea, and people from children to adults love them. Now imagine seeing two people walking together both wearing bright pink bunny hoods. Sadly, no imagine one of them being a man. Nobody wins. Often times, they move from hats to sweaters or hoodies. Now these you think can't be that bad. 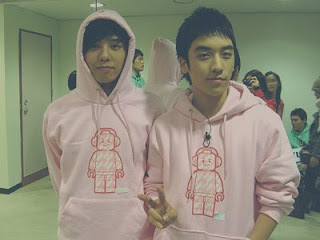 In fact it's almost cute that a couple would wear the same hoodie. It's how they show off how in love they are with each other right? Well actually its more about marking territory then anything else, but that's another story. The simple truth is that most of the times these hoodies were chosen by the woman. What that means is these guys are wearing very bright, and what would qualify back home as very gay hoodies. After the hoodie hurdle has been effectively jumped things go from bad to worse. Now comes the matching bags. No we all know that some men like to run around with man-bags or murses. No I'm not referring to the phenomenon known as male nurses either. Well, here in Korea, you guessed it. If you really want to show off you love your significant other you walk around with matching purses. Ohh the horror, ohh the shame, ohh the comedy. Matching bags are then followed by something that is actually quite standard in the United States, Matching Rings. 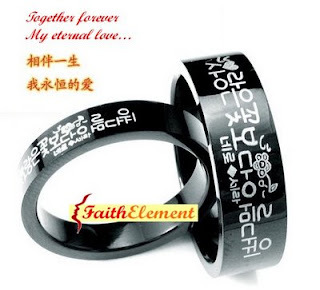 Here in Korea they are referred to as couple rings, and are not something that is to be taken lightly. You see until you have given your gf a couple ring you are not truly, seriously dating. These rings have the same significance as a promise ring, and are not that cheap either. However, if you have reached the stage where you are exchanging couple rings, you know for a fact that you and your gf are seriously dating. Finally, while we have gone over all the outer wear ways to let people know who you ar e dating. I haven't even hit upon the underwear matching. That's right folks, UNDERWEAR. We're not even talking like same color here, we're talking matching lingerie. Oh it's so sad, but extremely popular in Korea. Every single underwear, sleeping wear, and lingerie store that we pass by has on prominent display in the window, his and hers lingerie. Ohh yeah, the mannequins are rocking the most emasculating thing possible. Pink floral print boy shorts, on a man. *shivers* A wise man once said "I would do anything for love, oh I would do anything for love, I would do anything for love, but I won't do that, no oh oh I won't do that." I believe we finally found out what Meatloaf was singing about. Now just for funzies here is that wonderful epic ballad and video.